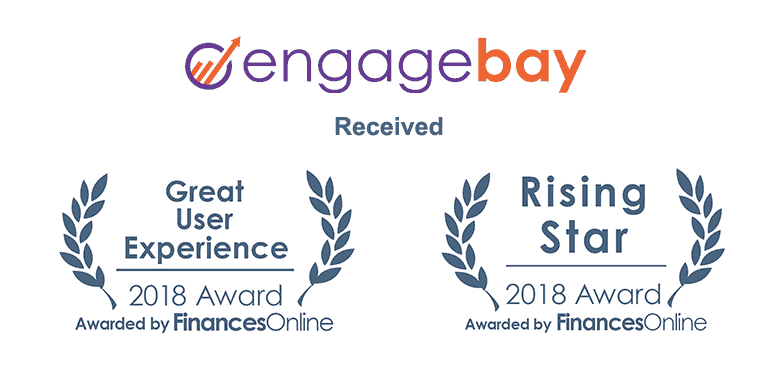 FinancesOnline, one of the most popular discovery platforms for B2B software and SaaS solutions, recently distinguished EngageBay with the 2018 Great User Experience and 2018 Rising Star awards. Having analyzed over 7,000 software solutions, including marketing automation software reviews, FinancesOnline serves as a go-to website for comparing and contrasting the best solutions in the market. They record over two million visitors monthly. FinancesOnline bestows its industry awards to software products analyzed in their marketing automation software study that has made a mark in the industry for various reasons. For EngageBay, the Great User Experience and Rising Star awards were given due to the software’s outstanding design and highly positive customer feedback, respectively. Aside from giving industry awards, FinancesOnline also commended EngageBay for providing great value for money, so much so that they ranked us on their list of affordable marketing automation software. Additionally, they noted several ways EngageBay can greatly benefit businesses that are looking to boost their marketing efforts. These include feature-complete yet affordable EngageBay pricing options, minimal learning curve, and all-in-one platform for all marketing needs. Head on to FinancesOnline to read their full critique of EngageBay. You can also leave a user review to share your experiences with our all-in-one marketing software.